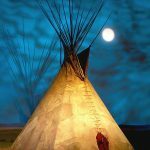 The buffalo hide lodge or tipi is one of the most practical shelters ever designed—easy to erect and take down, and resistant to wind and rain. In summer, the sides of the tipi can be rolled up for air circulation; in winter, a tipi liner keeps out cold air while a fire and animal hides on the floor keep the interior warm and comfortable. Adjustable smoke flaps help regulate draft. 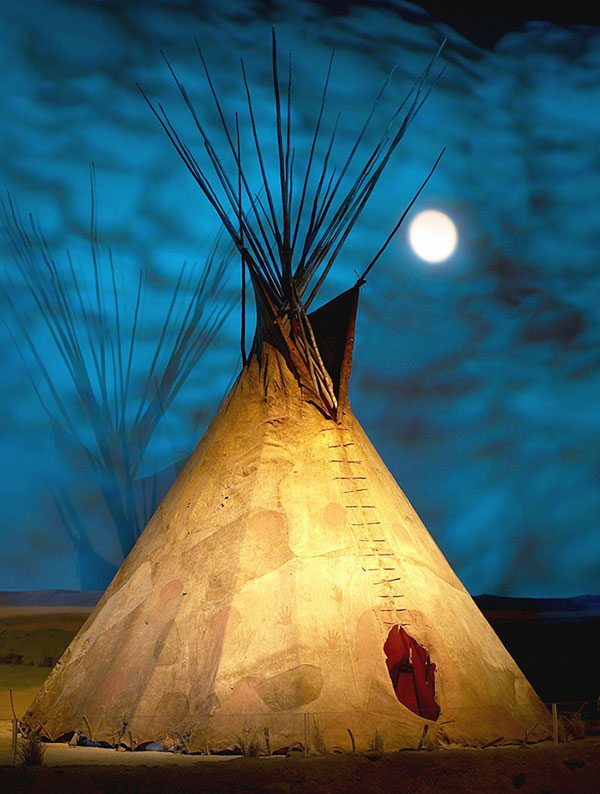 This Northern Plains lodge, the focal point of the Seasons of Life gallery in the Buffalo Bill Center of the West’s Plains Indian Museum, reveals the buffalo hide lodge to be as beautiful as it was practical. Dating to the middle of the nineteenth century, this lodge is approximately nineteen feet in diameter at its base. Thirteen buffalo hides sewn together with sinew make the cover, and the painted designs are of natural pigments. Buffalo hide lodges became larger once tribes had horses and so traveled longer distances. With the destruction of the vast buffalo herds by the 1880s, hides became scarce, and people began using canvas, available from traders, as material for lodge covers. Canvas is still used today on lodges. Hide lodge covers are now quite rare and tupically found only in private or museum collections, making this example extremely significant. Learn more about this hide lodge in this VIDEO.